The FILCOTEN tec channel system offers the superior characteristics of FILCOTEN and supplements these with additional safety aspects. Anchoring ribs ensure a secure bonding with the surrounding concrete bed. The special design of the galvanised steel rails allows for secure grating locking with the fi X self-locking system. 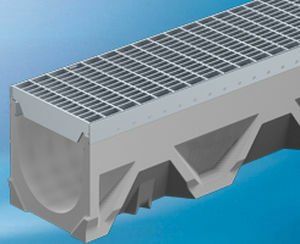 Adjacent covering surfaces can easily be attached to the edges of the rails. The FILCOTEN tec mini is the shallow channel for limited heights applications. The channel system is resilient up to class C 250 (in accordance with EN 1433). versatile and thus possible for almost all areas of application. Optimal for installation in pedestrianised areas, parks, sports and leisure facilities, car parks and similar surfaces.